Occasionally, I like to write a story or a play. This is the short story version of the play the children presented in Bashaw last week. It’s inspired by an old celtic tale of two brothers who didn’t get along and the village priest who enlightens them. The characters and the setting are a little different here. Long, long ago, there was a tiny little town called Bethlehem. It was kind of in the middle of nowhere in a country called Judea, a not very popular place way and gone in the backend of an empire controlled by powerful corporations and mighty conglomerates who were only interested in what they could get out of you, like oil or cheap manufacturing, and then there were the taxes, oh the taxes. But that’s for another time. In those days, Bethlehem was so small it only had one stable, a tiny little place, full of all kinds of animals. There were cows, chickens, pigs, dogs, cats, mice, even a rabbit or two, a wise old donkey who rarely left his stall … and sheep. Oh, the sheep. They pretty much ran the show in those days. They weren’t really mean or bossy or anything like that, it was just that … well, there were the sheep of the hills and the sheep of the valley and they never did see eye to eye. You can imagine that the other animals were not too fond of this arrangement. “I wish they were more friendly,” said one of the dogs. “Why can’t they get along like we do,” said one of the chickens. “I wish they’d share their food,” said one of the pigs. “Mooove them somewhere else,” said the cows. “Something’s coming,” said the donkey. Some of the animals had their own ideas of what to do about the sheep. “Build them their own stables,” said one of the dogs. “Make them take turns,” said one of the chickens (who secretly wanted their own pecking order). “Make them share their food,” said one of the pigs. “Mooove ussomewhere else,” said the cows (who sincerely hoped they were ‘herd’). “Something’s coming,” said the donkey. The sheep didn’t like any of these ideas. “We want to stay in this stable. It’s ours,” said the sheep of the hills. “No, it’s ours,” said the sheep of the valley, “and, sure, we could take turns – as long as we go first.” “No, we’re first,” said the sheep of the hills. “And don’t even think about sharing our food.” “Maybe you should move on. That wouldn’t be so baaaad,” said the sheep of the valley. “Something’s coming,” said the donkey. “What?” said all the sheep together (which really surprised them, since they’d never done anything together). Now the donkey, whose name was Ezekiel, was an old donkey who’d traveled to many places, and all the other animals knew he was very wise. If anyone could do something about the sheep of the hills and the sheep of the valley, it was Ezekiel. “What do you mean, Ezekial?” said one of the pigs. At that, there was much baaa-ing and snorting from the sheep. They weren’t sure, but they thought some work was coming their way. But Ezekiel had an idea. Well, the sheep of the hills were pretty excited. Their wool was the finest and fluffiest anywhere. And the sheep of the valley knew exactly where the best straw was stored, and lots of it. “What will you bring, Ezekiel?” asked one of the cows, who was secretly concerned that the sheep of the valley might make a mooooove on her hay. “We shall see,” he replied. And with that, Ezekiel left the stable and walked off down the road out of town. Now, it wasn’t long before things started to get a little crowded in the stable. There was straw and wool everywhere! There wasn’t much room for the animals, the sheep of the hills and the sheep of the valley still didn’t get along and Ezekiel was nowhere to be seen. Finally, it was the day that Ezekiel was to return. The sheep of the hills and the sheep of the valley stayed out as late as they could, looking for the very last bit of wool and straw. It was starting to get quite dark when they headed back to the stable and they were almost there when they heard a noise. It was quiet and gentle at first, but soon it was all they could hear and they stopped and looked in amazement: there were angels, singing, in the sky! And then, just like that, they were gone. The sheep of the hills hurried down and the sheep of the valley ran quickly up and, as they came to the stable, they were surprised to find Ezekiel standing at the door with the other animals. “What’s happening?” asked the sheep. But when the sheep and the other animals followed Ezekiel into the stable, no one noticed the wool piled high towards the roof or the bales of hay stacked against the wall. All eyes were fixed on the baby, sleeping quietly in his mother’s arms. “Look what Ezekiel brought,” said one of the pigs. And they all watched as the mother gently put him down in the rough wooden manger. And the baby stretched and yawned and began to cry and his crying filled the whole stable. The sheep of the hills looked at the sheep of the valley. “I think he’s uncomfortable,” said one. “The wood is very hard,” said another. 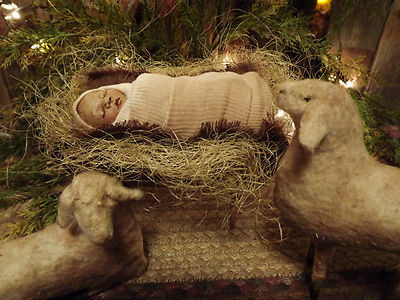 Then one of the sheep took some wool and another brought some straw and they put them together in the manger under the baby. And the baby smiled and stopped crying. And his mother rocked the manger gently back and forth. Like the sheep of the hills and the sheep of the valley, we sometimes forget what’s really important, and instead we let little things come between us and others, between us and the rest of the world. Christmas reminds us that God’s love for all came to us in a baby born in a stable.